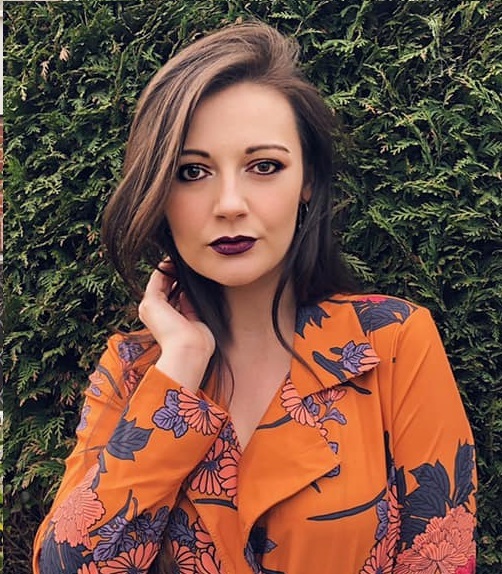 Saw this top on someones blog a little similar to this, and i knew i had to have this top. 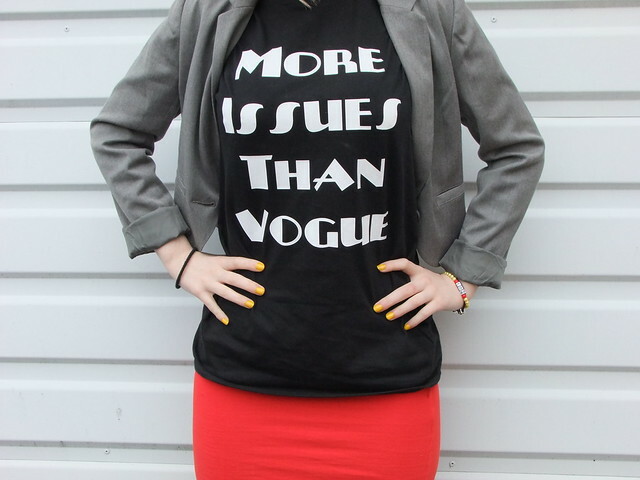 'More Issues Than Vogue' sums me up pretty well, and it's a fancy little slogan and i had to add it to my wardrobe and for only £10 too, SUCH a bargain. I got it in a size 12 as i wanted it too be loose and a tad baggy instead of fitted. I'm really not a fan of things which show all your lumps and bumps. 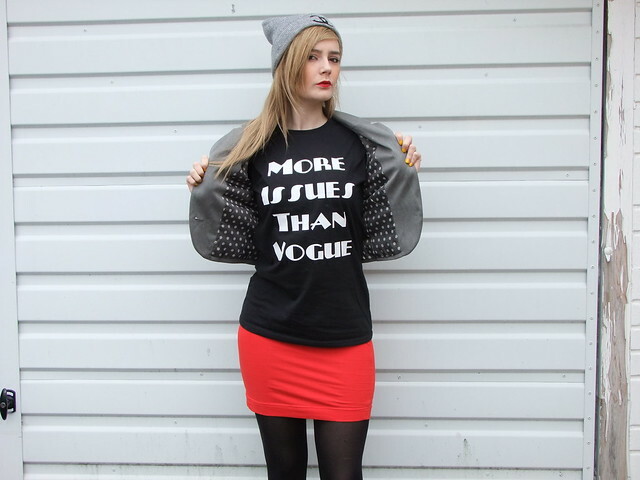 I thought to make the white writing pop i'd wear a red tube skirt to just add a bit of colour, i didn't think it was enough though and thought i'd add a bit of grey to not overshadow the outfit. 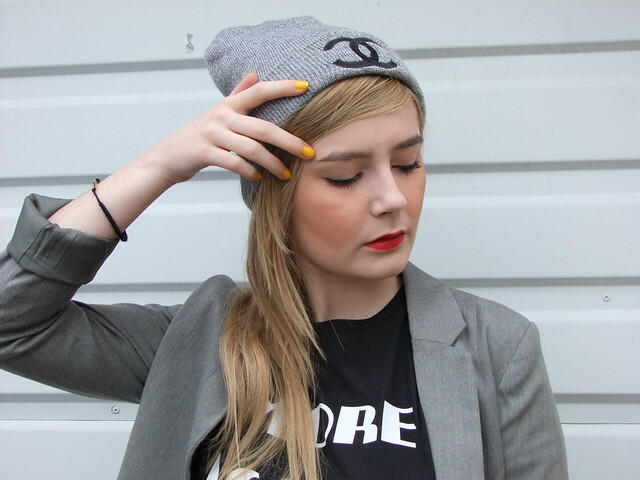 This cute little crop blazer and faux Chanel beanie was just the right needed little touch. I think i'm just having a chilled weekend, was going to have a 'daddy-daughter day' but i just don't have the energy to go and play crazy golf or go bowling unfortunately, which is a shame because it would of been nice, definitely going to do something next week i think. So i'm really going to try and start doing frequent youtube videos, so heres todays! Used my Ipad which only took 2 minutes to upload as oposed to the 3 hours it took from my laptop!! You are right, that top is amazing! I love your nail color too. Ha, I need this top! That beanie is really cute too. 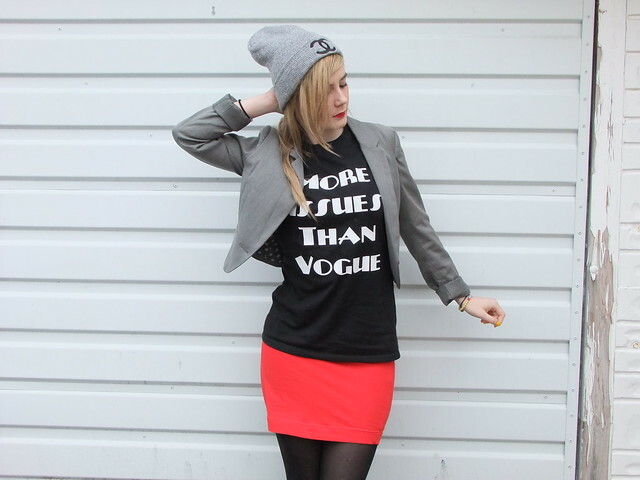 Great outfit, love the beanie and t-shirt!